Last Monday (3rd June 2013) I was fortunate to be able to attend the first of two days at the Consumerization of IT in the Enterprise (CITE) conference at the Marriott Marquis in San Francisco, CA. This was the conference’s second year, and drew a healthy attendance of delegates, many of them CIOs and CTOs for significant organizations. Consumerization is here, and IT executives are realizing the importance of embracing it. My employer, BMC Software, was present as a sponsor, and was demonstrating several products including our new end-user-focused product MyIT. In addition to some time in the booth, however, I was also able to attend a full day of conference sessions, and with a strong agenda it was often difficult to choose between overlapping meetings. Asked about the top challenges arising from consumerization, the most popular answer, from over 82% of large organizations was security, followed by privacy and compliance issues (65%) and lack of control (53%). One challenge that was not called out by the majority of organizations was the inability to measure ROI. 69% of large enterprises responded that this was not a top challenge. Asked if they were confident that they were ready to increase access to consumer technologies in the workplace, only 15% reported that they were “very confident”. 45%, however, responded that they were “somewhat confident”. Interestingly, this has doubled since the 2011 survey. Productivity is an objective: More than half of the respondents are looking to achieve increased productivity and better employee access to work materials anytime/anywhere. A fascinating presentation by Cisco’s Marie Hattar (@MarieHattar) pointed out that over 99% of the things that could be connected to the internet still aren’t. That’s 1.5 trillion things, of which 96.5% are consumer objects. Putting it another way, it’s 200 connectable things per person*. This, Cisco believe, is a $14.4 trillion market just waiting to be addressed, a case set out in more detail in their white paper here. We are already in the age of the “Internet of Things”, they argue. The “Internet of Everything” is the next step on the journey. (*my brilliant colleague Chris Dancy (@ServiceSphere) probably gets close to that number with a single arm, but we should probably place him amongst the leaders on this metric. You can watch him on this subject at the SDI conference in Birmingham, UK, on 19th June. More details here). In an interesting panel discussion alongside Kevin Jones (@KevinDJones) and Ted Shelton (@tshelton), Tom Petrocelli (@tompetrocelli) of ESG Global argued that the traditional hierarchical organization is changing. This is a challenge to those who might normally move up the hierarchy, if it is not in their interest for their organizations to transform into a more disparate, networked structure. Social enterprise, according to Petrocelli, is not so much a technical challenge as a management one (edit at 8:16PM BST 10th June 2013: Tom has tweeted me with what I think is a useful addition: “Remember, though collaboration is a management problem and technology isn’t the answer, it is part of the answer”). Brian Katz (@bmkatz) of Sanofi presented an entertaining analysis of good and bad mobile applications. 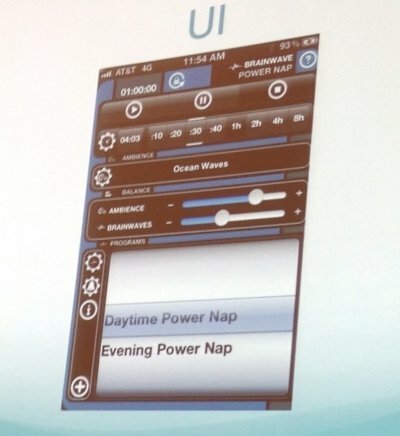 Brian Katz presented examples of good and bad mobile UIs. Guess which category this fell into? There was a strong message too: “If you don’t have a mobile strategy, you don’t have a strategy”. Brian’s view is that organizations should develop their apps on mobile, then bring them to tablets and desktops. Microsoft Word, for instance, has hundreds of features, which would make no sense to a user of an iPad application. From a mobile applications point of view, one thing that was abundantly clear is that there is still no consensus on the HTML5-versus-Native debate. TradeMonster’s CIO, Sanjib Sahoo (@SahooSanj) put a passionate and solid case for the former. An HTML5 approach enabled them to deploy a trading application more quickly and less expensively than their competitors. Their app is strongly rated by users, and Sanjib spoke of HTML5 being seen as a “great long term strategy”, while acknowledging difficulties such as memory footprint, and the fact that HTML5 is not yet a true cross-platform technology. He also pointed out that the limited data cache available to HTML5 applications compared to truly native applications is not really a problem for real-time trading applications where live data is the key requirement. For other requirements, it’s definitely more of a factor.